August 18 was a special day -- a day for celebrating my friend Cara and the baby she and her husband Gregg are expecting in October. 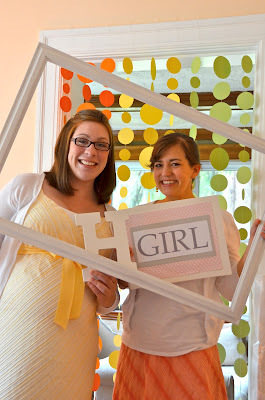 Rebecca and I co-hosted the shower, and had a wonderful time planning every last details and doing all the preparations. 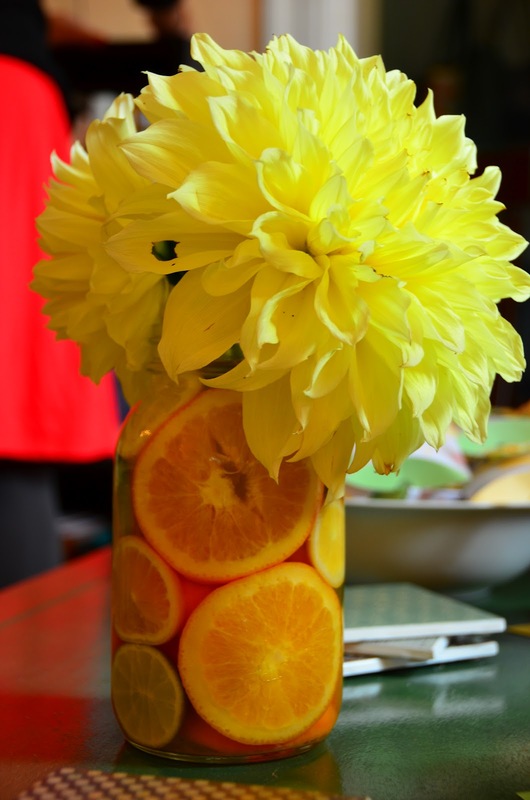 Since Cara and Gregg elected not to find out the gender of Baby Hanson, I had the idea of going with a citrus themed baby shower, because I thought gender-neutral colors (yellow, green, and a little orange) lent themselves so well to the idea. Rebecca and I met to come up with a plan for the shower, and divided up our preparation responsibilities. 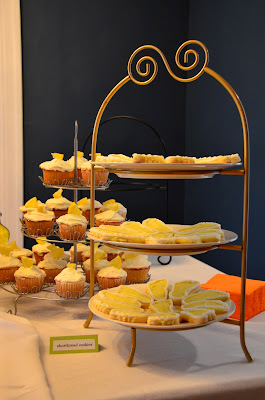 We came up with a menu and both volunteered to make some of the food, and Rebecca took care of games and activity ideas while I did a lot of the decorating, since the shower was at our house. I got to work on the decor preparations a little over a week ahead of time. 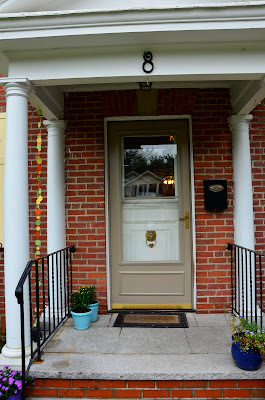 I used these letters from Martha Stewart for the 'Welcome Baby' garland. 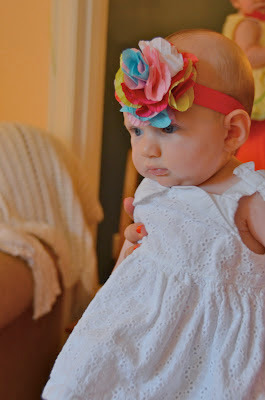 The tissue paper poofs were easy to make; there's a Martha tutorial for that, too! Then, inspired by some circle garlands I'd seen on Etsy, I set to work cutting out a few hundred paper circles (no big deal) and then sewing them into chains. I used my Fiskars circle cutter, which has the advantage of being able to do a wide variety of sizes (most of my garlands were a mixture of 1 inch, 1.5 inch, and 2 inch circles) but the disadvantage of only doing a layer at a time and being a bit more time consuming to use than, say, a circle punch (I don't have one of those). Once all the circles were cut, I just sewed them with a straight stitch set longer than usual, and let the machine run six or seven stitches in between circles. And one just to the left of the front door, to help guests find the house easily and set the mood for the shower. Did you notice those citrus-lined mason jars with the amazing dahlias on the mantel? Yeah, getting those fruit slices in position is a little trickier than you might imagine. I had seen pictures of the idea online, but hadn't thought it would take me an hour or two realize the concept. But I was pleased with how they turned out! And Rebecca provided the beautiful flowers. 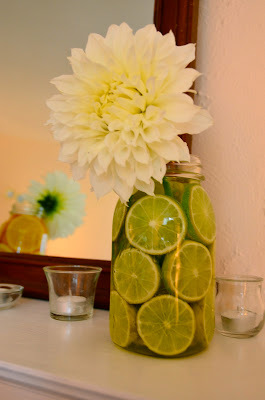 I had one vase each of lemon, orange, and lime for the mantel, plus a jar lined with mixed fruits on the coffee table. 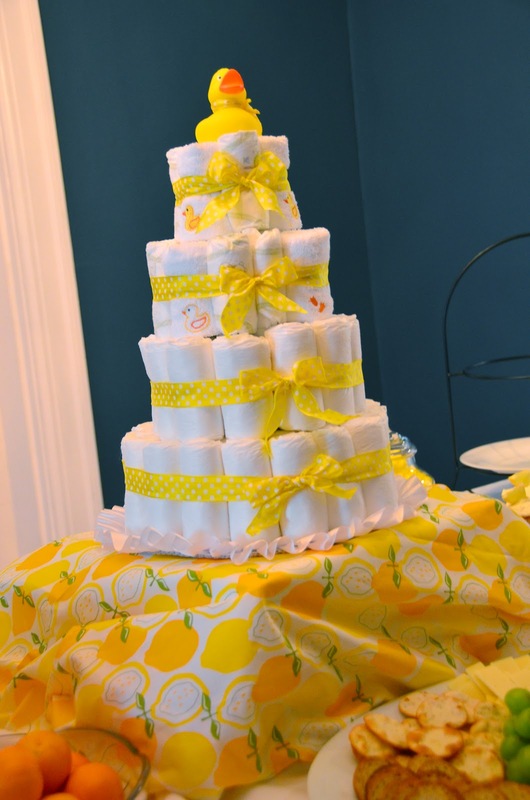 Rebecca made a diaper cake for Cara -- both decorative and functional! 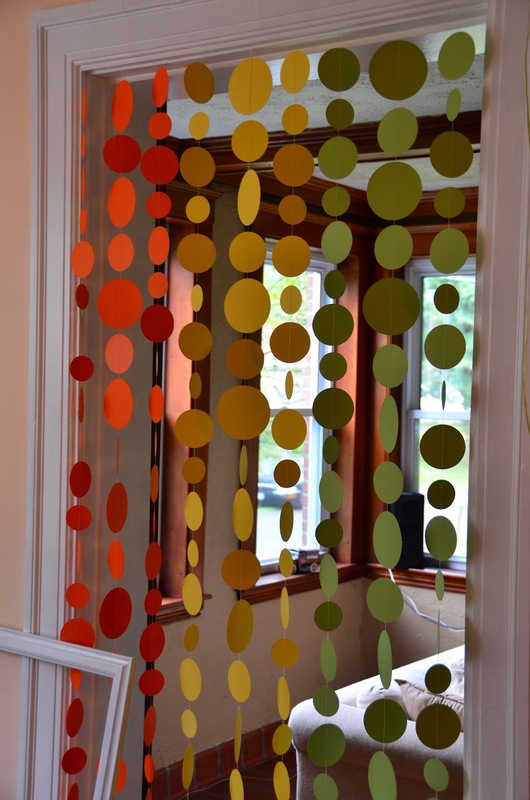 I also made nine garlands of single colors in alternating larger and smaller circles and hung them in groups in a doorway to create a 'photo booth' backdrop. Rebecca had the wonderful idea of doing a photo booth where guests would be photographed with Cara holding up signs of their gender predictions. I made the backdrop and painted a big frame I found in our basement white, and Becca made gender prediction signs and brought a big letter H for a fun prop. When the guests arrived, each one got a turn in the photo booth -- starting with the father and mummy-to-be! 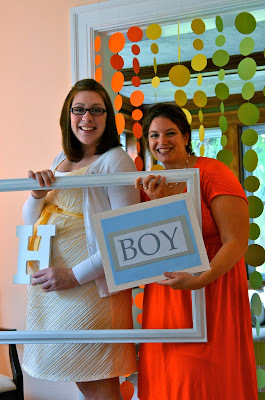 Rebecca is predicting a boy, too. I'm guessing Baby H is a girl, just to go against the flow (and the old wives' tales). But Nell looked at the 'boy' sign when presented with both options, so we decided that was her guess. Of course, in addition to decorations and photo booth fun, there was also lots of food. Of course I ran out of time to garnish them with whipped cream, but they tasted amazing. 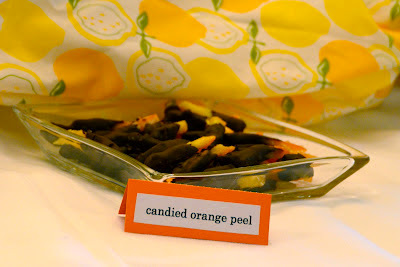 I also made candied orange peel dipped in dark chocolate. 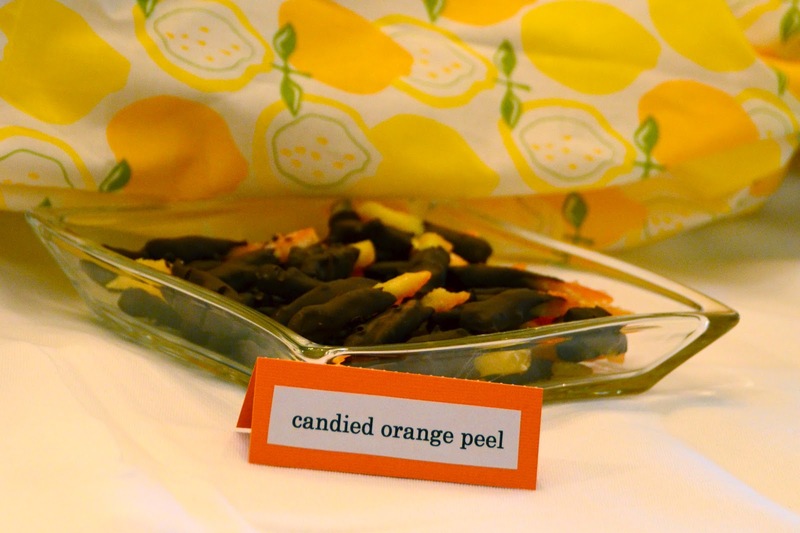 I set out some gummy citrus slices too, since they went with the theme so nicely. And a cheese tray I assembled. And some of her lovely family members made spinach quiches, which sadly, I didn't manage to photograph. For beverages, we served lemonade, orangina, and iced tea. 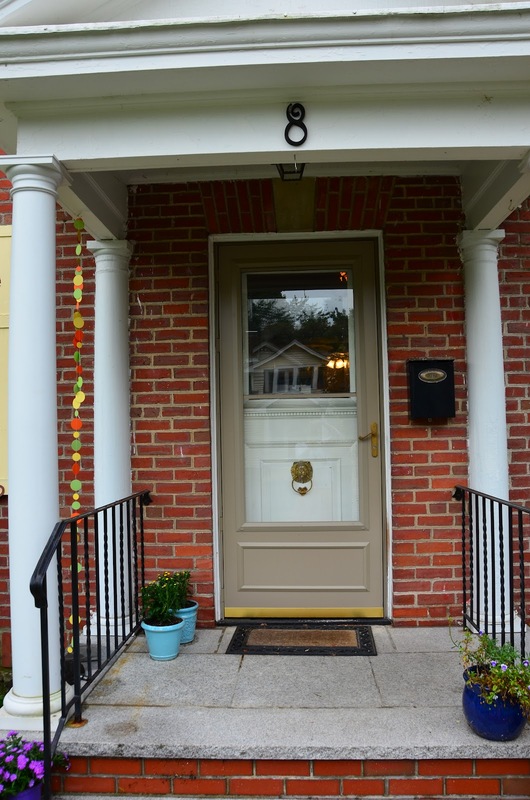 In all, we had fourteen adults, three children, and four babies present. After everyone had enjoyed some food, we played a couple of short games, including a gender prediction game based on old wives' tales. There were so many predictions for a boy that we ran out of little blue onesies and had to put some pink ones on the 'boy' side of the chart! After games, Cara opened gifts. 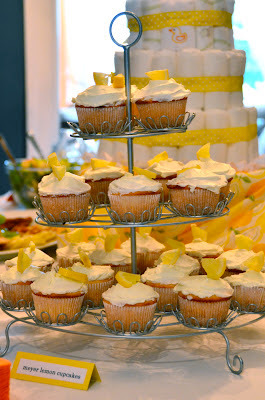 And we sent guests home with the favors Rebecca had prepared. 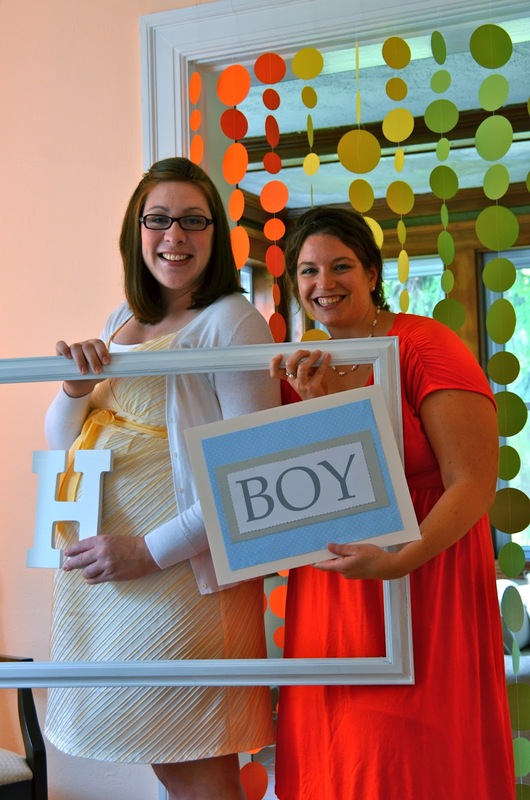 It's perhaps worth a few photos of the babies of varying ages there to celebrate Baby Hanson's impending arrival. How about a size comparison between these two girls, so close in age? Wow... crazy, right? Megan is a bit petite for her age, and Nell is long and chubby chubby chubby! Rebecca's daughter Ellie (pictured here with her grandmother) was the oldest of the babies present, at seven and a half months. 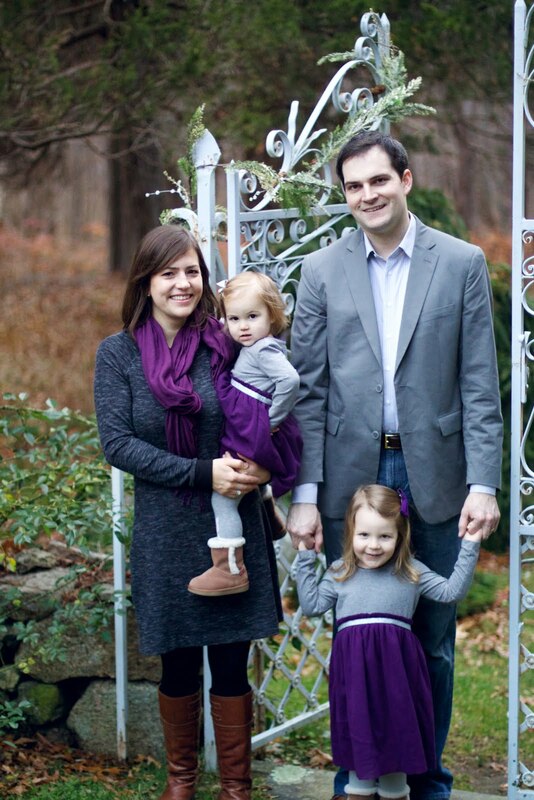 That's three little girls and a little boy, all looking forward to a new friend. 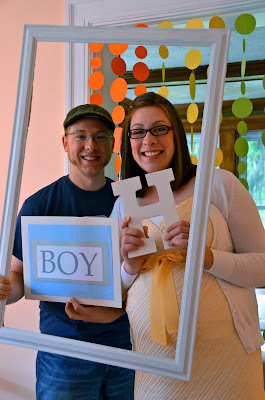 Dear little Baby Hanson... we are all so excited to meet you soon! So that was Cara's baby shower. You know you're hoping Rebecca and I will plan YOUR next event. Do you think we could become party planners? We certainly enjoyed planning this one! Wow, impressive! Looking at all the different decorations/food and thinking about how much time that must have taken kind of makes me dizzy! Not sure if I could ever pull off a shower like that, but I admire those who do! It is a neat way of showing love to people, Sarah; I'm sure you are a great blessing to your friends. 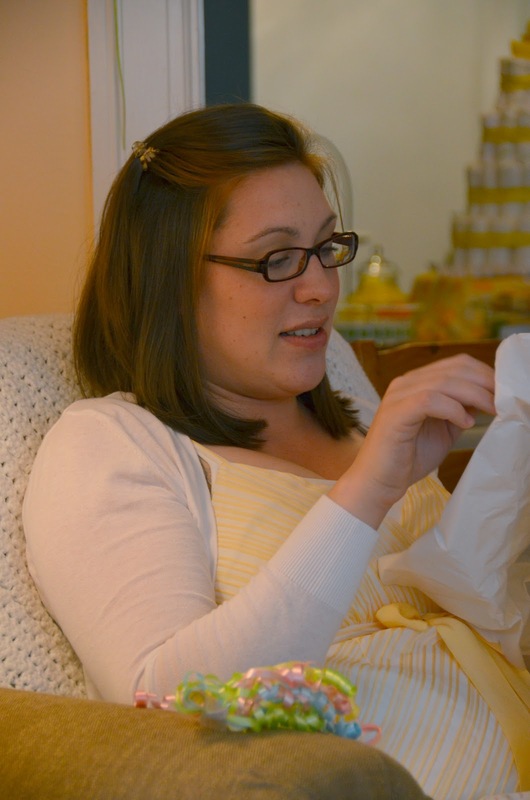 Amber, I can't believe you've never had a baby shower! That's crazy... all babies should be welcomed to the world with big parties and extravaganzas. :) Maybe for your next one...? Come to Massachusetts... 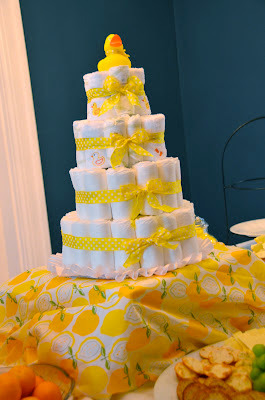 I happen to have some good baby shower decorations lying around somewhere. Well, all I can say is that I'm pretty sure you got those creative genes from your dad. They sure didn't come from your mom! Great job! I just FINALLY got to look at your post last evening!! I love it!! Thanks for capturing all the details and sharing...we did do a good job! It was lovely working together, we'll have to do it again! !